The Sacramento icon was honored for his Hall of Fame induction before and during the festivities. Those words from head coach Dave Joerger on Hall of Famer Vlade Divac ring true every night, but especially on Sunday. 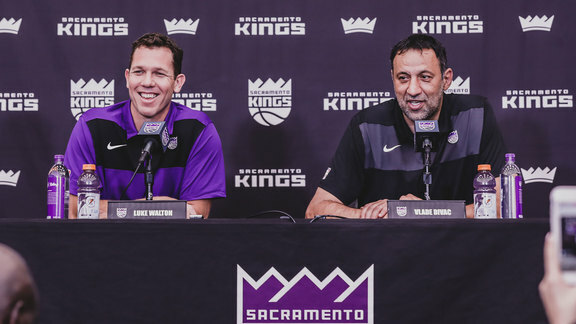 On a beautiful evening in Sacramento, Vlade Divac could hardly contain his excitement — and emotions — on what Saturday's announcement meant to him and his family. On Saturday, the NBA announced its inductees into the Naismith Memorial Basketball Hall of Fame, with Divac being honored as part of the International Committee. The Class of 2019 will be enshrined on Sept. 6 in Springfield, Massachusetts, where No. 21 said he will be inducted as a member of the Sacramento Kings. With a raucous home crowd on their feet, Sactown gave Divac an ovation worth remembering. With his jersey hanging in the rafters, the Kings legend put his hand over his heart and thanked the fans at Golden 1 Center. Currently serving as General Manager, Divac explained the importance of this phase of his basketball career as well. With a Hall of Fame enshrinement imminent, Kings fans would love that as well.